Manchester, England (AP) — Joe Root survived one chance but not a second one, and Ben Stokes fell just before stumps, as England finished Day 1 of the final test against South Africa on 260-6 on Friday. 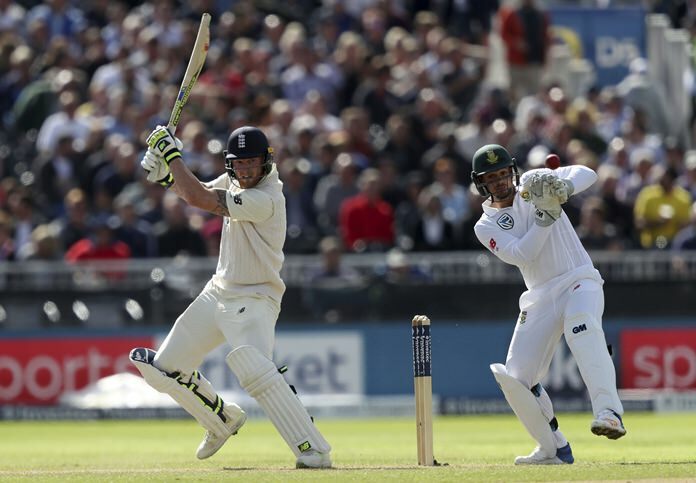 The in-form Ben Stokes was bowled for 58 by Kagiso Rabada an over before the close at Old Trafford, giving South Africa a late boost after the tourists twice had England in a hole early in the series-deciding test, and twice saw the home team fight their way out. Jonny Bairstow was 33 not out and nightwatchman Toby Roland-Jones 0 not out at the close. Although South Africa, trailing 2-1 and seeking to save the series, edged the day by virtue of their six wickets, a score in excess of 300 by England could be competitive on a feisty pitch that gave the Proteas quick bowlers plenty to work with. England also still have Moeen Ali, a handy batsman, to come as they seek a second straight series win over South Africa, but their first at home over the Proteas since 1998. England twice had to dig deep on Friday, when they were 92-3 with Tom Westley’s departure, and then at 187-5 when Root was lbw for 52 to Duanne Olivier. England fought well both times, first with a 52-run stand between Dawid Malan and Root, and then with late-afternoon resistance from Stokes and Bairstow in a 65-run partnership that nearly took the home team to stumps. Rabada had other ideas, spearing in a quick yorker that blew past Stokes’ bat and rattled into his stumps. Rabada collected 2-52 and Olivier 2-72. The day reflected the seesaw nature of the series, which has swung one way and then the other: England won heavily in the first test, South Africa dominated the second test, and England were convincing in the third test. For the decider, Olivier was in the team after South Africa were forced to leave out the injured Vernon Philander, the tourists’ best bowler on current form. South Africa’s pace attack was further weakened with the absence of Chris Morris, also injured. England skipper Root was again the prize wicket for South Africa after a let-off allowed him to reach his fourth score of 50 or more in seven innings this series, and pass 5,000 test runs. Root was missed on 40 after South Africa wicketkeeper Quinton de Kock allowed a nick off Morne Morkel to fly past him without moving, apparently thinking it was going straight to first slip. It was well wide of Hashim Amla at slip and De Kock, realizing his big error, sat down and covered his face with his glove. It cost South Africa just 12 runs — to De Kock’s relief — as Olivier trapped Root lbw fairly soon after, with an added bonus for South Africa as Root wasted a review. That was one of few errors this series for Root, who began his time as England captain with a magnificent 190 in England’s victory in the first test, has batted superbly through the series, and showed strong character to lead England back in front in the series after his leadership was questioned following the second-test defeat. For Root, his 5,000 test runs have come at a fabulous rate: 57 tests and 105 innings, putting him among some outstanding names. Brian Lara took 104 innings to pass 5,000 and Sachin Tendulkar 103 innings. Root made a brave decision at the start of the day, choosing to bat after winning the toss with the knowledge that there’s been rain in Manchester this week and the pitch was likely to give early help to the bowlers. It did, but England lost just Keaton Jennings for 17 — another failure for him — in the first session and ground their way to 67-1 at lunch. The second session swung South Africa’s way with the departure of Alastair Cook (46) and Westley (29) in the space of three overs, and with Malan out for 18 an over before tea. All three of them edged behind. Root again held up South Africa, hitting six fours and registering a 30th test half-century, to go with 12 centuries, in just 57 tests. Stokes struck eight fours in his 58.